The Kuwanomi-iro, is a dark red purple, such as as ripe mulberry of its name. 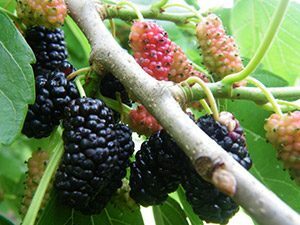 The color that has been dyed with a mulberry, the English name “Mulberry”. Although the days of peace was called “Kuwazome” “Kuwa-iro”, because the tan dyed with mulberry bark was also referred to as the “Kuwazome” “Kuwa-iro”, Edo in order to avoid confusion It came to be called “Kuwanomi-iro” from the time of. Mulberry, generic name of the mulberry family hoe genus. Deciduous trees. Bark is tinged with gray. As bait of silkworm Bombyx mori for taking silk, an important crop since ancient times, it has also been used as a fruit tree. Mulberry is flowering in the spring, fruit such as raspberry is ripe in early summer. Ripen and become dark red, it has been with the edible from the ancient times. Hoe is “KUHA” is etymology of leaf eat silkworms, and also appeared in the “Chronicles”.